I came across this prayer in the back of the July/August/September 2011 issue of Living Faith. It seems a good one for the days I've been having lately . . . I have to admit, Lord, that I'm glad to see this day over and done. Thank you for seeing me through all its difficulties. Grant me the rest I need to face another day tomorrow, one I hope will be better than today. Help me to see the opportunities for grace in the situations I face. Give me confidence in your abiding love for me and for all the people I am concerned about. Amen. 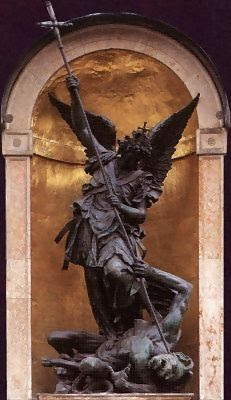 I know it is late in the day for me to post this, but today (September 29th) is the Feast of the Archangels - St. Michael, St. Gabriel, and St. Raphael. 40 Days for Life Starts Today! 40 Days for Life Begins September 28th and goes through November 6th. It consists of prayer, fasting, peaceful vigil, and community outreach for an end to abortion. Please prayerfully consider what you can do to help support the cause. Thank you! Thank you to those of you who prayed for my friend's baby. Her heart surgery was today (postponed from yesterday) and she came through as well as can be hoped for. She is now in the intensive care unit. At Bible Study today, we were discussing Adam and Eve and the first sin. Eve was promised knowledge of good and evil and that, if she ate the fruit, she would never die. She had to make a choice between obeying God and the implied promise of good things to come or having something that seemed good now. It is the same choice we all have to make, and it determines the course of our whole lives. Do we believe in heaven and the promise of a blissful eternity beyond what we can imagine? Are we willing to sacrifice now with all the pain that entails because it is the right thing to do and the life God asks of us? Do we believe that this is all there is? In which case, suffering and sacrifice make no sense and serve no purpose and we should really try to squeeze as much self-indulgent pleasure out of every day that we can, no matter who we hurt in the process. Under the heading of "Books I Would Love to Get My Hands On" comes this one by Mike Aquilina. A Year With The Angels is a volume of contemplation and prayers about those most mysterious of all created beings: The Angels. 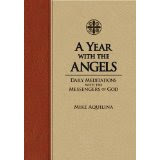 A Year With The Angels invites you to discover the authority and strength of the Heavenly Host. Angels embody virtues, graces and knowledge of the truth because they stand before the very throne of God. Among the Angels' responsibilities are governing the universe and the movements of nature, and acting as messengers of God to mankind. This year, learn to appreciate our unique relationship with the Angels, especially those Angels assigned to protect us during this life on earth. Our times have become indifferent toward Eternal Life and a righteous Fear of God, consequently a very little awareness of the Souls in Purgatory. Ignorance of the Church as threefold — here on earth as the Church Militant, in purgatory as the Church Suffering, and in heaven as the Church Triumphant — reduces true and holy union and the help each can be for one another. Our responsibility to aid each other here on earth by living holy lives is forsaken and so, too, assistance by Masses and prayers of those suffering in purgatory. The true nature of Mass as the supreme prayer of Jesus to the Eternal Father is lost as many want to sense spiritually good without the sacrifice which makes all things holy. "While giving help to the souls undergoing purification after completing their earthly journey, teach people that they have (here) no lasting city, but they ought to seek the one that is to come (cf. Heb 13:14). Thus your spiritual and religious life will give you strength for taking on this apostolate, so abundant in fruits, which has been entrusted to you." We Marian Fathers wish to recommit ourselves, and you our Associate members, to praying daily for the deceased. With this in mind we set forth the Holy Souls Sodality as the fulfillment of our Constitutions #19 "following the abiding faith of the Church in the communion of saints in the mystical Body of Christ, with great devotion honors the memory of the dead and offers suffrages for them." The Church has also a high regard for the Muslims. They worship God, who is one, living, and subsistent, merciful and almighty, the Creator of heaven and earth, who has also spoken to humanity. They endeavor to submit themselves without reserve to the hidden decrees of God, just as Abraham submitted himself to God's plan, to whose faith Muslims eagerly link their own. Although not acknowledging him as God, they venerate Jesus as his prophet; his virgin Mother they also honor, and even at times devoutly invoke. Further, they await the day of judgment and the reward of God following the resurrection of the dead. For this they highly esteem an upright life and worship God, especially by prayer, alms-deeds and fasting. Please pray for my friend's baby who is having open heart surgery on September 22nd. Many of us are on the road of our life journey, and we know that “somewhere up the road” we will find happiness, wholeness, rest. We sometimes tend to focus so exclusively on the destination that we miss all the good stuff in between. It's a good reminder to enjoy what is going on now (at least as much as I can!) while I wait for that elusive rest. Nancy couldn't ask for a better dog. Three months after her October 2005 mammogram at age 42 come back clean, she was bothered by one of her golden retrievers, a dog named Ben. Ben began placing his paw on Nancy's right breast each morning. She was getting annoyed after about six weeks of this behavior. "I said, 'Ben, stop that, it's really starting to hurt!'" She then put her hand where her dog had been directing her and felt a lump.. . Following Nancy's surgery, Ben never again placed his paw on her in that manner. Do Men Think Smart Girls Unattractive? Unfortunately, the person women become while they’re single and pursue a career can be unattractive to certain men. By certain, I am thinking about Catholic men who want a traditional role of provider, and hope to have a stay-at-home mother for their children. Does that sound too old-fashioned and stereotypical? Maybe even shallow? 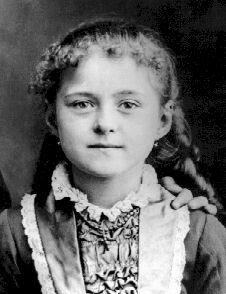 Regardless, a serious Catholic man will not mind a smart woman, as long as she is smart enough to want to give up her career once children come along and stay home to raise them. That’s what they are thinking. And this is where a HUGE misunderstanding occurs, and both men and women can mess things up. The fact is, smart, educated, intelligent, practicing Catholic women who are successful career women do want to give up their careers to stay home with their children and be homemakers! Certainly, this is true of some women, but not all. There are those who were truly destined to be mothers. They have spent their whole lives dreaming of the day they could nurture small children and they excel at it. And then there are those who, yes, want to be mothers, but also want something else. Some women are totally fulfilled by motherhood and that is wonderful. Others, like me, are not. I love being a mother and I try to do the best I can at that vocation, but if I didn't have the opportunity to use my education and my skills in some way, my mental health would greatly suffer! I look forward to my time in the evenings when I get to work. Most women I know, dedicated mothers all, work part-time in some fashion - whether that be from home or outside the home. God gave us talents and the opportunity to be educated. Why would He not want us to use them in some way? Amazingly, not one of the people (thusfar) who commented on this article took issue with this statement. Maybe the question should be, "Why do these men feel we need to give up our brains when we have children?" of this day in America ten years ago. where some are bent on terror and destruction. some no more than children. for people still suffering from injuries and terrible memories. In her third novel, Ellen Gable weaves a suspense-filled pro-life story. "Stealing Jenny" focuses on Jenny Callahan, looking forward to the delivery of her sixth child after a difficult pregnancy complicated by placenta previa. Jenny must have a c-section or else both she and the baby will most likely die. Her mentally unstable infertile neighbor has been eying Jenny with great envy and interest. That baby should be hers! She hatches a sinister plot to kidnap Jenny and steal her unborn child. Will the police find Jenny in time? What will happen to her husband and family left behind? The second half of this book is particularly gripping. You won't want to put it down. Ellen Gable is an NFP instructor and staunchly pro-life. She frequently writes non-fiction focusing on these topics. Her fiction is one more vehicle to get that message out to a larger audience. 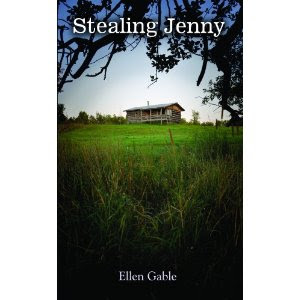 "Stealing Jenny" is an enjoyable story with a solid Catholic message. It is a worthy addition to the Catholic Fiction genre. Hail Mary, full of grace, the Lord is with you. Blessed are you among women, and blessed is the fruit of your womb, Jesus. 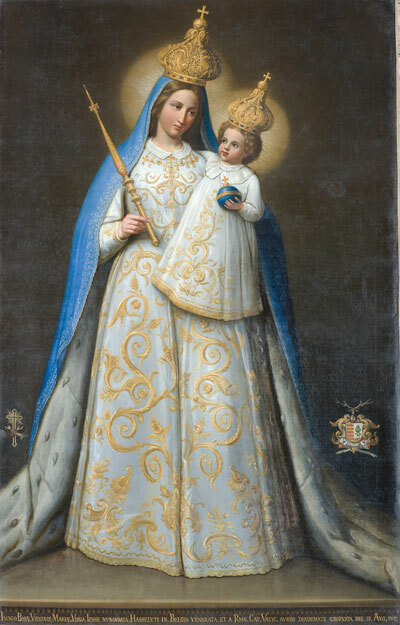 Holy Mary, Mother of God, pray for us sinners now and at the hour of death. Amen. I love sunflowers. Each year, I plant a few and wait all summer for them to grow and flower and show their happy faces. My first sunflower of this year bloomed right before Hurricane Irene hit us. I hoped that my flower would make it through the storm. It did! However, it is now severely bent over. The day after the storm, my younger son remarked that it "looked like the hunchback of Notre Dame!" Here it is, a week later, and that stalk has produced several more blooms, all trying to turn their faces toward the sun. And so it is with us. We get beaten down by the storms of life. At times, we may be barely able to stand (both figuratively and literally), but we can still bloom and bring beauty to the world. We can still turn our faces toward God and rest in his light and grace. Here in the U.S. today is Labor Day. The day, best known now as the unofficial end of summer, is nearly done as I write this, but I thought I would offer a couple reflections I came across regarding what the Labor movement meant to this country and what the Catholic position is concerning it. People can honestly disagree about whether we still need unions in this country, but the simple fact remains that our way of life would be radically different had they never existed. The Cure for Your Child's Boredom? With this being the season for back to school, Bishop Timothy McDonnell quoted the following poem in his most recent column. It is a good reflection - for all teachers, and that includes ALL parents. We all teach our children every day of our lives. A teacher is . . . a path, to help avoid a fall. A teacher is . . . an ear, to listen when others call. A teacher is . . . a voice, with which to talk and sing. A teacher is . . . a hinge, on which the future swings. A teacher is . . . a shield, for stopping Satan's darts. A teacher is . . . a hand, to touch a lonely heart. A teacher is . . . an arm, to lift hearts from defeat. A teacher is . . . a light, to awaken those who sleep. A teacher is . . . a rock, to be solid for each day. A teacher is . . . an example, to show Christ is the way. A teacher is . . . a hope, while traveling earth's sod. A teacher is . . . a life, dedicated to God.